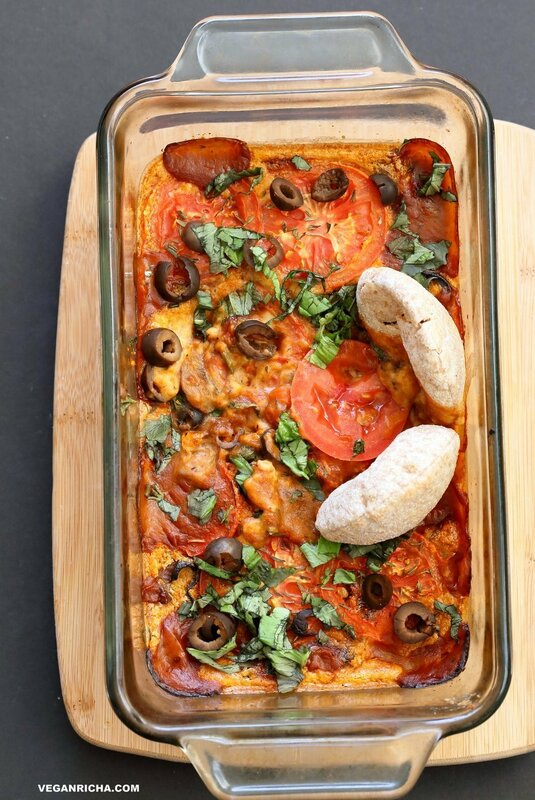 Vegan Pizza Dip. Easy Pizza Dip with sauteed mushrooms, olives, pizza sauce and from scratch Vegan Cashew Mozzarella cream sauce. Cheesy and Stringy. Gluten-free Recipe. Can be soy-free. SuperBowl is just around the corner. Sadly Seahawks wont be there this year and Russell will be missed. I whipped up this Pizza dip in the half time of the last game. At the end of the video, Chewie was barking away because of the high energy of the last quarter. He knows when his daddy is worked up. We ate half of the dip with the warmed up mini wheat pita breads and later used the rest to make pizza grilled sandwiches! Dip between 2 slices, with some other veggies and greens thrown in, grill and serve. There are layers of Pizza sauce, sauteed herbed mushrooms and onions, vegan mozzarella style cream sauce, layered with some tomato slices, olives and finished with fresh basil and pepper flakes. The cream sauce has starches that thicken and do their starchy thing during the baking. When the dip is hot out of the oven, there is a cheesy stringy texture and flavor all mixed up with the pizza sauce and mushrooms and olives. 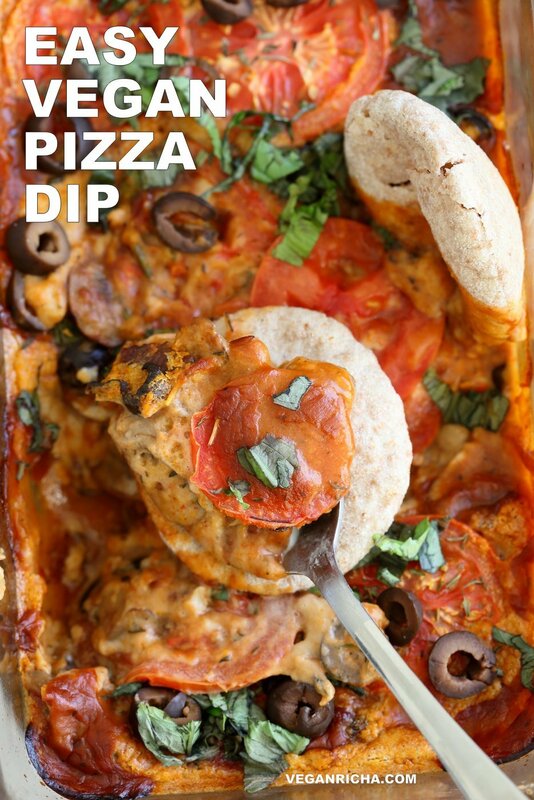 All the mess that a pizza dip should be. Make the mushroom onion saute: Heat oil in a skillet over medium heat. Add onion and cook for 2 minutes. Add mushrooms and toss well. Cook partially covered for 7 minutes. Add thyme, salt and pepper flakes and mix well. Cook for another 3 to 4 minutes or until golden. Drain the cashews if soaked. Blend all the ingredients under mozzarella cream, Taste and adjust salt and tang and set aside. If you omitted the miso, you might need to add more salt. Prep the rest of the ingredients. Preheat the oven to 400 degrees F / 200ºc. In a loaf pan, or other small baking dish, Add some of the pizza sauce and spread it out, then a some of the mozzarella cream. Distribute the mushroom mixture over the cream. Add another layer of pizza sauce, another layer of mozzarella cream. Sprinkle olives all over. Place tomato slices on top. Sprinkle salt, thyme or oregano. Bake at 400 deg F / 200ºc for 25 minutes. Sprinkle fresh basil and pepper flakes on top. 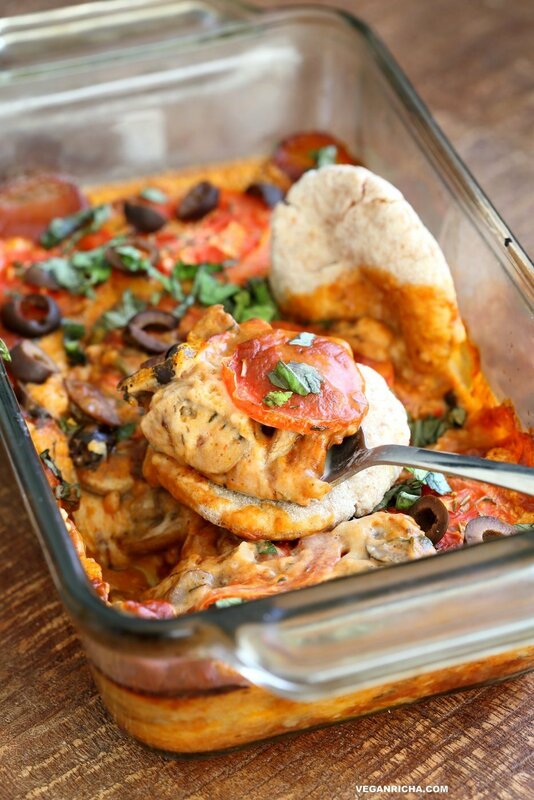 Serve hot with crusty bread, garlic bread or pita bread. I use mini wheat pitas that have been warmed in the oven in the last 5 minutes of the dip bake time. Quick Pizza Sauce: 6 oz tomato paste, 2 tsp or more italian herbs to taste, 1/4 tsp salt, black pepper, 1 tsp olive oil, 2 tsp minced garlic, water to thin (3/4 to 1 cup). Mix everything and use. Ha ha! Yes I’ve been busy on the testing blog and forgot about this one! I’ll be making the deep dish pizza tonight. I just made this last night and it was delicious! Everyone loved it. Thanks for the great recipe! I added in green peppers with the onions/mushrooms and used corn starch instead because I didn’t have potato/tapioca starch. Anyway to make this cashew-free my wife is allergic to cashews. Do you need to soak the cashews at all? it depends on your blender. soak them for 15 minutes so they blend faster and make a smooth cream. This was fantastic! served it to a non vegan, non gf crowd and everyone loved it. Easy and delicious, will make again! Is the cream sauce supposed to be runny before baking. I have a batch in the oven and am nervous it won’t set up. yes it is runny and thikens up because of the starch. Did it work out ? you can use the cauliflower alfredo or pumpkin seed alfredo in this. the cauliflower alfredo right after blending will work. Thanks so much for your quick reply! I will give it a shot this weekend! I made this for a potluck and it was a hit with everyone. I also used the cashew cheese for a baked ziti dish (I heated it up a bit to thicken it first) and liked it better than my usual Mozerella recipe. Thanks for this!! I made this today, as part of our traditional New Year’s Day all-day snack party. The dip tastes delicious, but the mozzarella sauce is very runny, and did not thicken after cooking 🙁 I used all tapioca starch. hmm, did you use cashews? I am not sure why it didnt thicken. Maybe it needed a bit more tapioca if there was more moisture in the tomato sauce that would add a bit to the cream as well during baking. You can bake it longer and some moisture will dry out and help in thickening. Or transfer the dip to a bread bowl and bake to warm through again. The bread will absorb some moisture. This looks really good! Do you think you could make it ahead of time, store in the fridge and warm when ready? Thanks! Has anyone tried using this in a crockpot to keep it warm? That was what I was thinking, I have made this several times but always served it right away.